GR11. 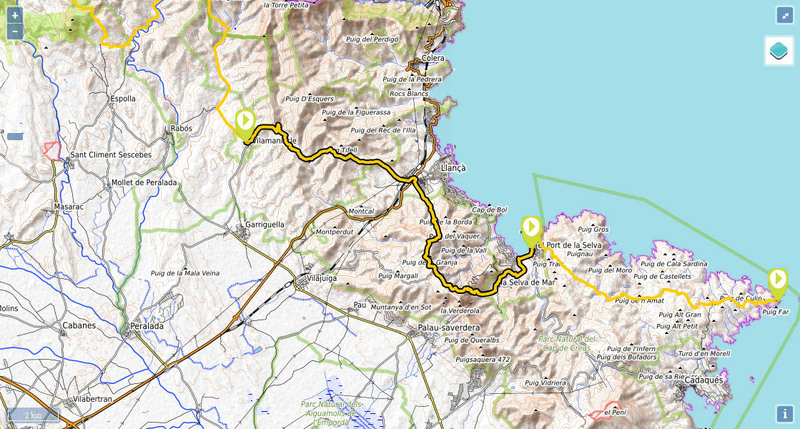 Stage 45: Vilamaniscle - Port de la Selva. Tiempo: 5h45min (walking time without stops). Difficulty: take care with the heat. 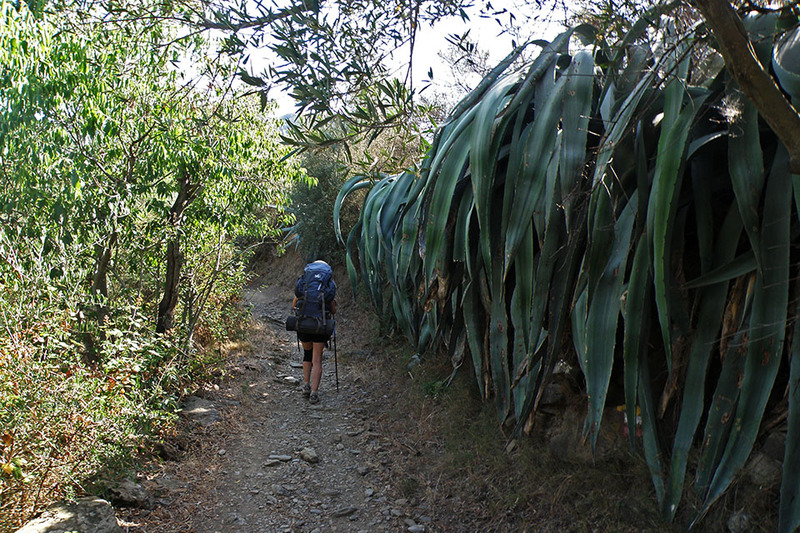 The descent to La Selva de Mar is steep. 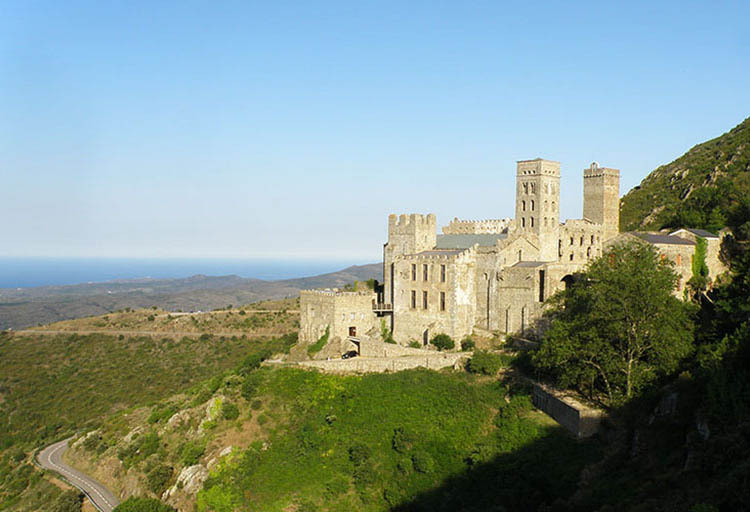 Water: you will find water in the villages and in Sant Pere de Rodes. (0h25min; 1,6 kms) Col de la Serra (258m). 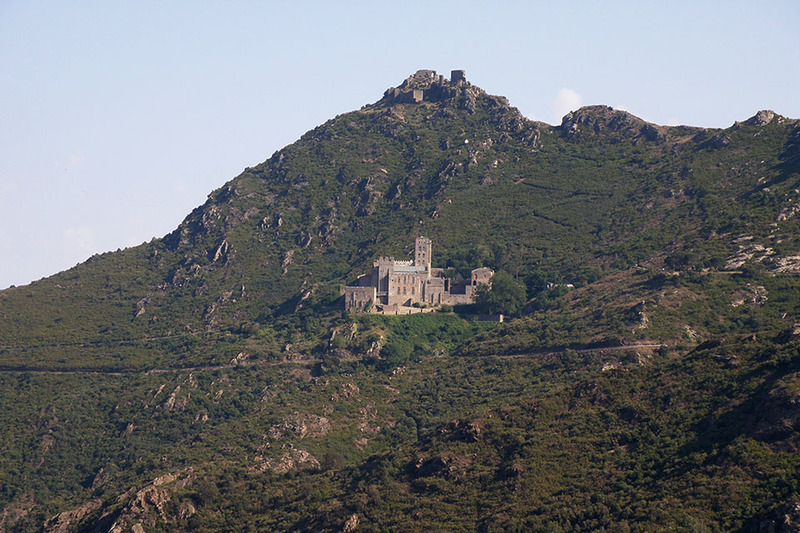 Soon after reaching the top, at the junction, you follow the track on the right, which you stay on for about 2 kilometres until a path on your left drops sharply down to the Romanesque chapel of San Silvestre. The red and white markings coincide with other red and green markings. (1h05min; 4,4 kms) Sant Silvestre de Valleta (118m). 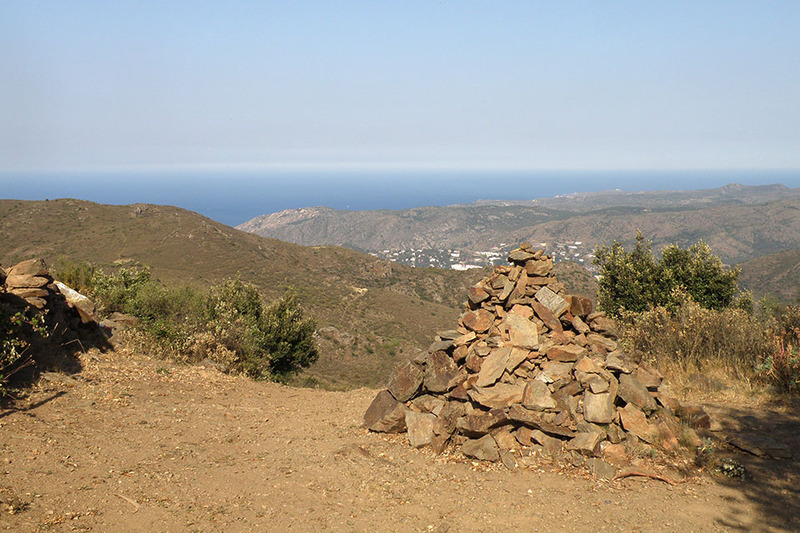 In Sant Silvestre the red and white markings of the GR11 disappear. Keep left, following the red-green and yellow markings that quickly lead you up to a track where the red and white markings reappear. Continue uphill to the left along a track. (1h30min; 5,9 kms) Col de les Portes (228m). The Mediterranean is visibly closer. 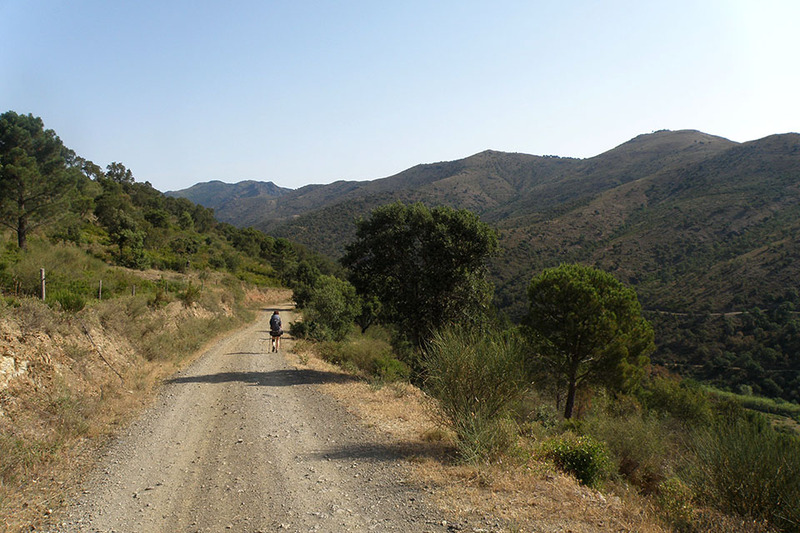 You quickly head down the track towards Llança. As you arrive, you pass below the railway tracks and turn left, walking parallel to a road that you later cross, after 200m. Head towards the Tourist Information Office up ahead. (3h10min; 12,2 kms) Coll del Perer (346m). Turn right and continue climbing up to a large rock, which marks the end of the tough part of the climb, where you join a wider path. 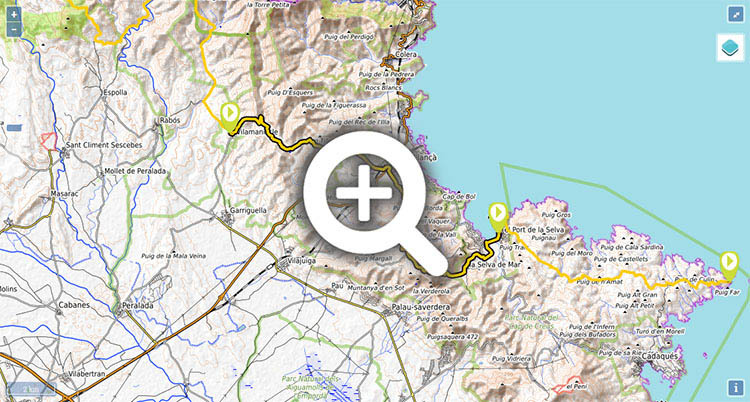 Follow it for 1.5 kms until you come out at the road that joins Vilajuiga and El Port de la Selva. At the crossroads go straight on. (4h05min; 15,3 kms) Sant Pere de Rodes (510m). Below the monastery wall there is a drinking fountain. 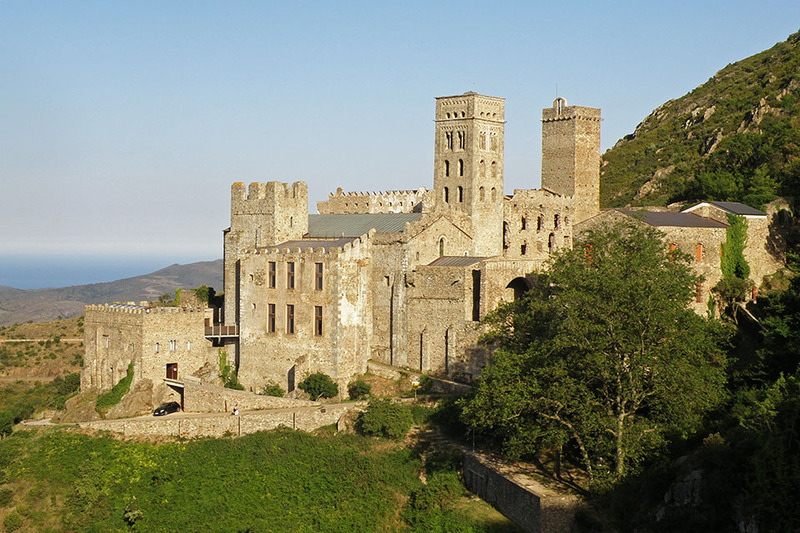 The Benedictine Monastery of Sant Pere de Rodes was built in a Romanesque style that was unconventional for its time. The church dates back to the 10th century and the façade is from the 12th century, although there were other buildings prior to this one, possibly even Roman. Head down some steps to the left, next to the monastery entrance, then turn right below the southern stretch of the wall along a cement track that heads down to a car park. Once at the car park, on the right, you will see a path that zigzags down a steep slope, and towards the end, heads along the bottom of the Rec dels Gatiens valley. 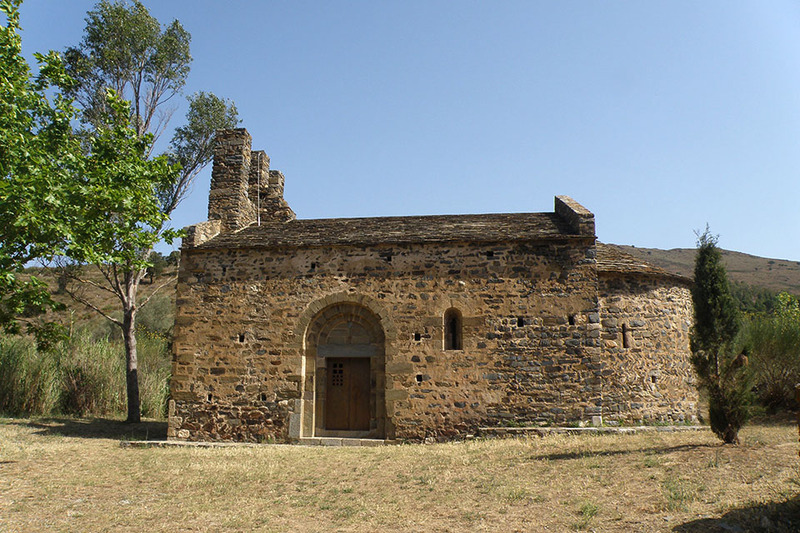 Shortly before reaching La Selva de Mar, you pass by the Chapel of Sant Sebastià, of Romanesque origin, that looks more like a castle. 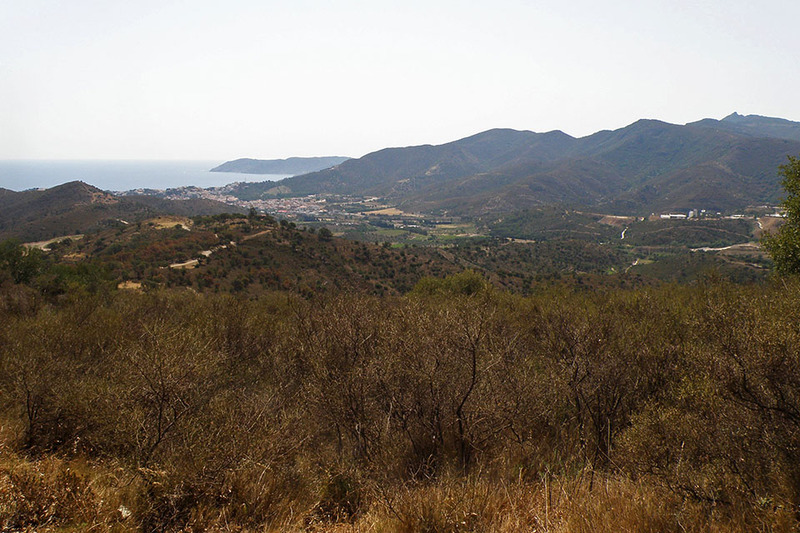 (5h45min; 21,2 kms) Port de la Selva (6m). 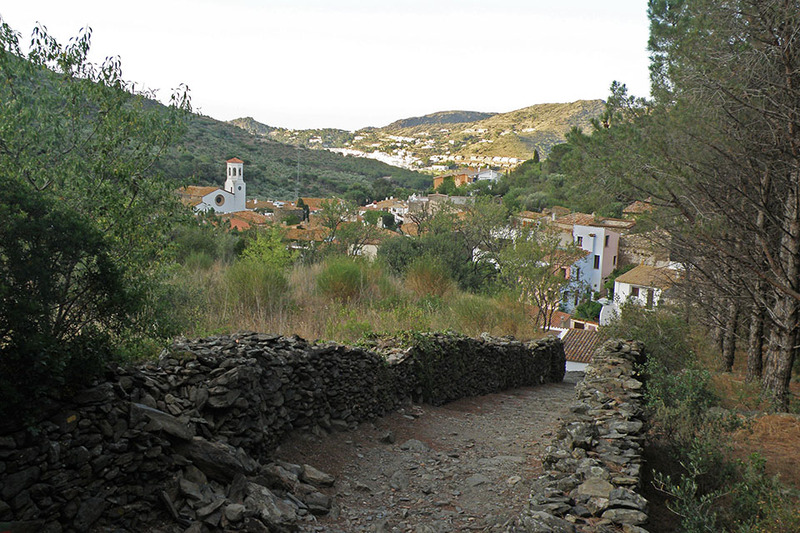 At the beginning of the stage, in Delfià, on the road betweenRabós and Garriguela (a 5km diversion from the crossroads between Rabós and Vilamaniscle or 3kms by track from Vilamaniscle), we recommend Can Jenot en Delfià (//) . It has two apartments for 3 and 5 people, a swimming pool, washing-machine, internet, fridge…The price per person is 60€ with breakfast and dinner included. In July and August, it is only available for the whole week. In Vilamaniscle, Mas Vivent. For large groups Casa Colonias Tramuntana. Below the swimming pools, an area for wild camping has been made available for walkers. In Llança, there is no shortage of accommodation. Right by the GR11 and for a budget price, you have the Hotel Gran Sol. 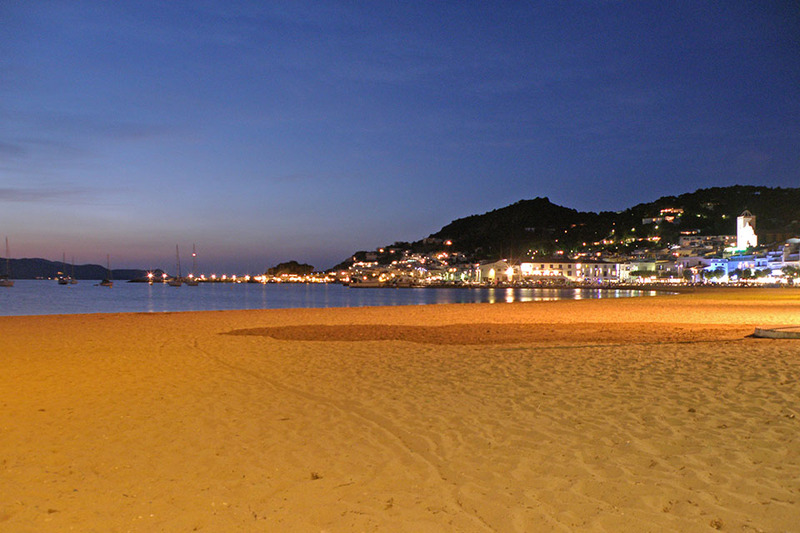 Also among the cheapest options are: Alberg Costa Brava and Pensió Restaurant Llança. In la Selva de Mar: Fonda Felip. At the end of the stage, in Port de la Selva, there is a wide range of accommodation catering for all budgets. Among the most economical: Hostal German , Hotel Agora or Cal Mariner. In Vilamaniscle there is a municipal swimming-pool with a bar. 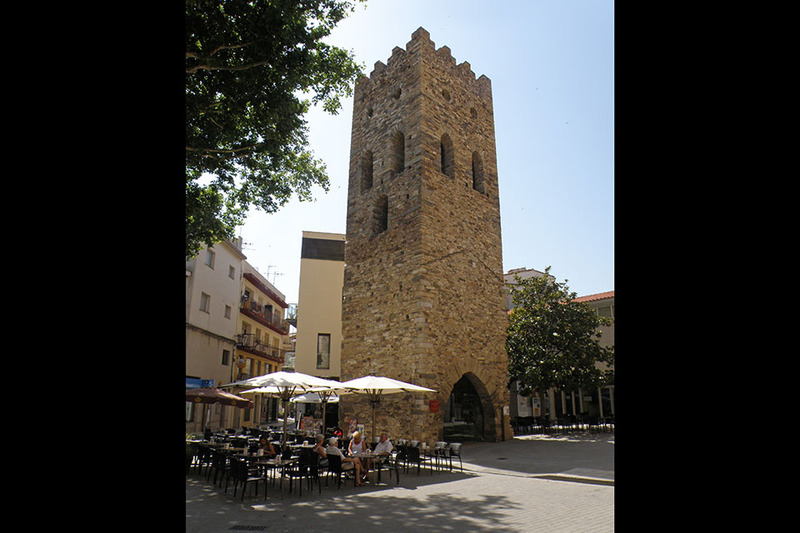 In Llançà, you can find all kinds of shops, supermarkets, restaurants and hotels. In Port de la Selva, all possible services are covered.